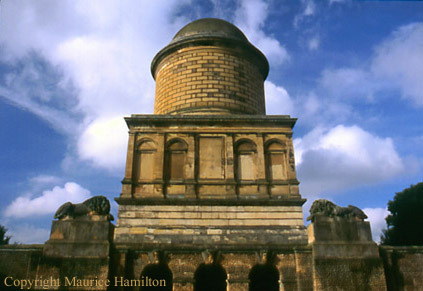 One of the more distinctive, if unusual, landmarks around Hamilton is the Hamilton Mausoleum. Erected for Alexander, 10th Duke of Hamilton (1767-1852), at a cost of 30,000 pounds, the Mausoleum rose from its foundation in 1842 but was not completed until 5 years after the death of the Duke. Standing 120 feet tall, the building is known for having the longest echo of any building in Europe, an echo which may last 15 seconds. Indeed, the acoustics are so poor that the Chapel, the main part of the Mausoleum, was never used as a place of worship. Yet a whisper from one of the alcoves of the octagonal Chapel can be distinctly heard in the opposite corner. The lower part of the building, the vaulted basement, leads to the Crypt. At the top of the stairs are two large lions, one awake, the other asleep, each carved from a single piece of freestone. The original bronze doors, now housed inside the building, are facsimiles of panels on the Ghiberti doors at the Baptistry in Florence. The Duke, known as "El Magnifico," was embalmed with spices he purchased and buried in a remarkable Egyptian sarcophagus (later transferred to the family plot at Bent Cemetery) bought in Paris in 1836 by the Duke on behalf of the British Museum. Originally believed to contain the body of the Queen of Amasis, it was found upon arrival at the British Museum to have entombed Iret-irw, a lady without royal descent. Whereupon "El Magnifico" offered to refund the money and keep the sarcophagus himself, an offer which was acceptable to all parties except, perhaps, Iret-irw. The Duke transferred the sarcophagus to his London home, where he reportedly tried it on for size but found it too small. Stonemasons chiseled out some of the basalt for a more accommodating fit. Sic transit gloria mundi. Visitors should note that the interior of the Mausoleum can be visited only by guided tour, given once daily in the afternoon and, during weekends in June, July, and August, also in the evening. Requests for visits at other times may be made in writing. I suggest you contact Strathclyde Country Park (366 Hamilton Road, Motherwell ML1 4ED) for current tour times. Additional photographs of the mausoleum may be viewed in my Hamilton Mausoleum Photo Album.